Many people have enjoyed eating grapefruit for breakfast as a weight loss food. The grapefruit (Citrus paradisi) is a nutrient-rich fruit with various health benefits, including weight loss, appetite control, and diabetes prevention. Grapefruit essential oil is very versatile with many of the same benefits as a grapefruit. Grapefruit oil is extracted from the peel of the grapefruit, and it has been used for centuries to fight stress, inflammation, sugar cravings, and weight gain. This article details the health benefits of grapefruit essential oil, and how to best use it. Although the history of the grapefruit is a bit of a mystery, some believe that it was first grown in Jamaica. It was given the name grapefruit because it looked similar to grapes hanging from trees. The grapefruit has scientific names Citrus maxima and Citrus racemosa as well as the unique moniker, the “forbidden” fruit. Grapefruit essential oil has an aroma similar to grapefruit that is fresh, clean, and a little bitter. The signature smell and taste of citrus fruits is why it is a popular ingredient in natural household cleaner products, and homemade soaps, cosmetics, and beauty lotions. Grapefruit oil is naturally high in phytochemicals and antioxidants that help fight disease. Grapefruit essential oil benefits are largely due to the constituent called limonene, which reportedly accounts for 88% to 95% of the oil. Limonene is a phytochemical antioxidant believed to fight tumors, prevent cancer, and protect cells and DNA from damage. Other key antioxidants found in grapefruit essential oil include citronellol, pinene, terpinene, myrcene, and vitamin C.
What are the health benefits of grapefruit essential oil? Grapefruit essential oil is known for its stimulant, tonic, lymphatic, disinfectant, diuretic, astringent, antiseptic, and antidepressant properties. Research suggests that inhaling grapefruit essential oil can help activate relaxation responses in the brain, while also reducing blood pressure. Grapefruit essential oil inhibits the enzyme acetylcholinesterase activity, which could increase neurotransmitter action and improve a person’s mood. The effect may help fight brain fog, depression, fatigue, and stress. The vapors from grapefruit oil may also directly and quickly send messages to the brain region linked with controlling emotional responses. A study published in the Journal of Japanese Pharmacology in 2002 found that grapefruit oil significantly affected relaxation and brain activity in healthy adults. Inhalation of the oil led to a 1.5- to 2.5-fold increase in relative sympathetic activity that reduced stress and improved mood. They also experienced a reduction in systolic blood pressure. Research has found that the smell of grapefruit oil is associated with fat-burning responses within the brain. A study published in the journal Experimental Biology and Medicine in 2003 found that grapefruit oil can help control body weight through the activation of sympathetic nerve activity. The activation of sympathetic nerve activity has a positive effect on white adipose tissue, which is responsible for lipolysis. Grapefruit oil may also help you shed excess water weight because it can help boost a sluggish lymphatic system. The antifungal abilities of grapefruit oil can also help reduce yeast and bacteria overgrowth responsible for candida symptoms, such as sugar cravings, persistent fatigue, rectal itching, and abdominal pain. Research shows that grapefruit can fight other infections, including lung infections, nasal infections, and urinary tract infections. The antibacterial and antimicrobial effects of grapefruit oil could help decrease or eliminate harmful bacteria strains. Studies have found that grapefruit essential oil can fight bacterial strains responsible for food-borne illnesses like salmonella and E. coli. Grapefruit essential oil may also help with detoxification through increasing blood in the digestive organs—the kidneys, liver, bladder, and stomach. These positive effects on digestion could be useful for fluid retention, and fighting the harmful bacteria within the gut and intestines. Grapefruit oil is among the essential oils said to increase blood flow and lower inflammation. In turn, circulation will improve, and the reported blood vessel-dilating effects of grapefruit oil could potentially help treat headaches, bloating, muscle pain, fatigue, and PMS cramps. Grapefruit oil’s antibacterial properties may also have a positive effect on the skin, which could help fight bacteria that cause acne. 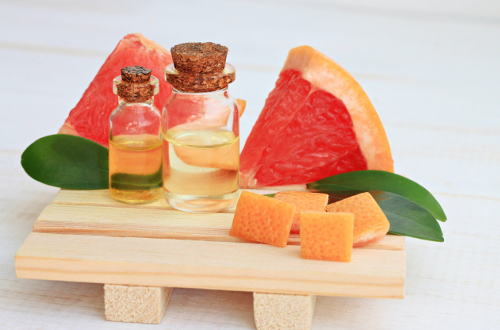 Grapefruit oil could also benefit skin by reducing cellulite; healing wounds, bites, and cuts; and preventing negative effects of indoor and outdoor air pollution and UV light damage. The addition of grapefruit oil to conditioner or shampoo can help decrease grease and sweat, and help the shine and volume of hair. You can also naturally flavor water, smoothies, and various meals with grapefruit oil. Diffusing grapefruit oil with other citrus scents like orange oil and lemon essential oil can also improve unpleasant odors in bathrooms, kitchens, and household appliances. You can use grapefruit essential oil by inhaling directly from the bottle or using an oil diffuser. This method is used for relieving stress, headaches, depression, and bloating and water retention. Once diluted with carrier oil like jojoba or coconut oil in a 1:1 ratio, grapefruit oil can be applied to the skin. Once combined, rub on acne-prone skin, sore muscles, and the abdominal region for improving digestion. Grapefruit essential oil should only be taken internally when a high-quality, 100% pure, therapeutic-grade essential oil is purchased that includes just grapefruit rind oil from Citrus paradisi. Here are a couple of grapefruit essential oil recipes to get you started. Combine coconut oil with grapefruit essential oil and store in a glass container. For treatment of cellulite, rub on affected areas for five minutes each day. Combine essential oils with the unscented shower gel in a glass jar. It is best to use this essential oil blend in the morning during an energizing shower. This helps you begin the day on a positive note. In general, grapefruit essential oil is safe; however, it may interact with medications, such as blood pressure medications and antidepressants. As a result, it is best to consult with your doctor before using grapefruit oil. It may also be a good idea to avoid direct sun exposure if using grapefruit oil on the skin may be more sensitive against sunburns and UV light. It is also best to do a skin patch test to check your reaction to essential oils like grapefruit oil because some people with sensitive skin may experience an allergic reaction. Grapefruit essential oil should also be used in moderation, since overconsumption can over-stimulate the gallbladder and cause problems like spasms, gallstones, and bile duct changes. “Grapefruit Essential Oil: Uses, Benefits, and Precautions,” Sustainable Baby Steps website; http://www.sustainablebabysteps.com/grapefruit-essential-oil.html, last accessed April 13, 2017. “Reap the Antioxidant Benefits of This Citrus Essential Oil,” Mercola, Dec. 29, 2016; http://articles.mercola.com/herbal-oils/grapefruit-oil.aspx. “10 Wonderful Benefits of Grapefruit Essential Oil,” Organic Facts; https://www.organicfacts.net/health-benefits/essential-oils/grapefruit-essential-oil.html, last accessed April 13, 2017. Essential Oils: All-natural remedies and recipes for your mind, body, and home (New York: Penguin Random House, 2016), 68, 172. Haze, S., et al., “Effects of fragrance inhalation on sympathetic activity in normal adults,” Japanese Journal of Pharmacology, November 2002; 90(3): 247-253. https://www.ncbi.nlm.nih.gov/pubmed/12499579. Niijima, A., et al., “Effect of olfactory stimulation with flavor of grapefruit oil and lemon oil on the activity of sympathetic branch in the white adipose tissue of the epideidymis,” Experimental Biology and Medicine, November 2003; 228(10): 1190-1192. https://www.ncbi.nlm.nih.gov/pubmed/14610259. Miyazawa, M., et al., “Inhibition of acetylcholinesterase activity by essential oil from Citrus paradisi,” Natural Product Letters, 2001; 15(3): 205-210. https://www.ncbi.nlm.nih.gov/pubmed/11858553. Wahab O., et al., “Essential Oil of Grape Fruit (Citrus paradisi) Peels and Its Antimicrobial Activities,” American Journal of Plant Sciences, July 2013;4(7B):1-9. DOI: 10.4236/ajps.2013.47A2001. “13 Grapefruit Essential Oil Benefits – Starting with Weight Loss,” Dr. Axe; https://draxe.com/grapefruit-essential-oil/, last accessed April 13, 2017.